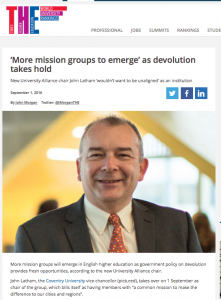 An interview with the new Chair of University Alliance Professor John Latham has appeared in Times Higher Education. Talking in his interview about the distinctiveness of University Alliance institutions, he described “a technology group of universities, those that have been heavily focused on supporting their region or city, vocational in a lot of the activity they do. If you think of the [government’s] degree apprenticeship programme, that’s quite a close fit to a lot of our members.